We had a really nice turnout for our first meeting of the year. It was decided we would meet quarterly, assigning three books to each quarter. This way we can take turns reading the books so difficult to find here in our little town, and in case you did not get to one, you still have something to discuss when you come to the next quarterly meeting. We discussed the books we read over the holidays and then turned our attention to the dozen books spread out in front of us on the table. I appreciated the guidance I had in choosing our selection from the many readers and reviewers at Goodreads.com. 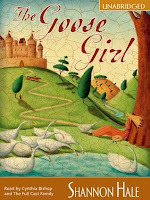 THE GOOSE GIRL, by Shannon Hale. And our non-fiction selection, any food book by Michael Pollan. Michael Pollan's last book , The Omnivore's Dilemma, launched a national conversation about the American way of eating; now In Defense of Food shows us how to change it, one meal at a time. Pollan proposes a new answer to the question of what we should eat that comes down to seven simple but liberating words: Eat food. Not too much. Mostly plants. 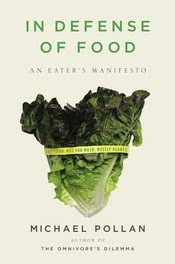 Pollan's bracing and eloquent manifesto shows us how we can start making thoughtful food choices that will enrich our lives, enlarge our sense of what it means to be healthy, and bring pleasure back to eating. Speaking of food, we enjoyed some treats of the non-written kind, as well. Click on the links to find the recipes for Bacon Maui and Roasted Red Pepper & Cheddar Dip. As always, you can check here for comments on the books we are reading, and are welcome to leave your own! I added The Road to my "to read" list. Yay! Thanks, Krista!